Cuisine: A mix of traditional French cuisine with a California touch and traditional American dishes. Décor: Relaxed setting with umbrellas and warm sunset colored murals on the patio. The secret is that the bistro is the creation of the Malecot family — Christian and Michel. 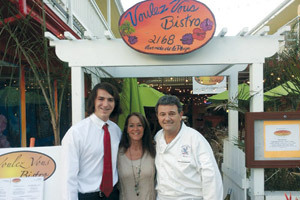 Christian Malecot, a 22-year-old business graduate of University of San Diego, is heading the restaurant assisted by his father, Michel, who has run several restaurants and a large catering business in La Jolla and Pacific Beach for 33 years. 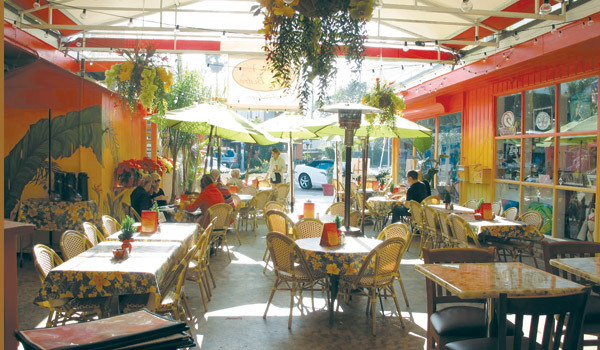 Michel’s restaurant, The French Gourmet in Pacific Beach, is renown for its bakery and its French cuisine. Christian has worked at The French Gourmet for eight years. The bistro is located in the space where Papalulu’s was (also close to Babarella). The colorful tropical décor offers a warm welcome to those who enjoy a relaxed beach setting. 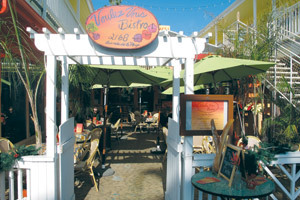 The patio is filled with colorful umbrellas and surrounded by French Polynesian-themed murals. Inside are the display cases for the bakery items and a few comfortable tables. This bistro prepares authentic French cuisine with a California touch and receives fresh-baked goods from The French Gourmet every day of the week. The boulangerie (French for bakery) offers croissants, sweet crepes and pastries. A flaky, buttery spinach and cheese croissant with a cup of coffee makes for a heavenly start to the morning. Savory crepes, eggs Florentine and omelettes are also available for breakfast. For lunch, a grilled chicken panini with tomatoes, jalapeño jack cheese and basil aioli on a French baguette will hit the spot. The bistro offers craft beer on tap and an expansive list of wine (personally selected by Michel). The bistro is a nice addition to La Jolla Shores whether you are interested in specialty coffees with croissants for breakfast, a festive Sunday brunch, a lunch on the sunny patio or a special dinner with French specialties and a great glass of wine.